Joel Edgerton has shown himself to be a strong director. 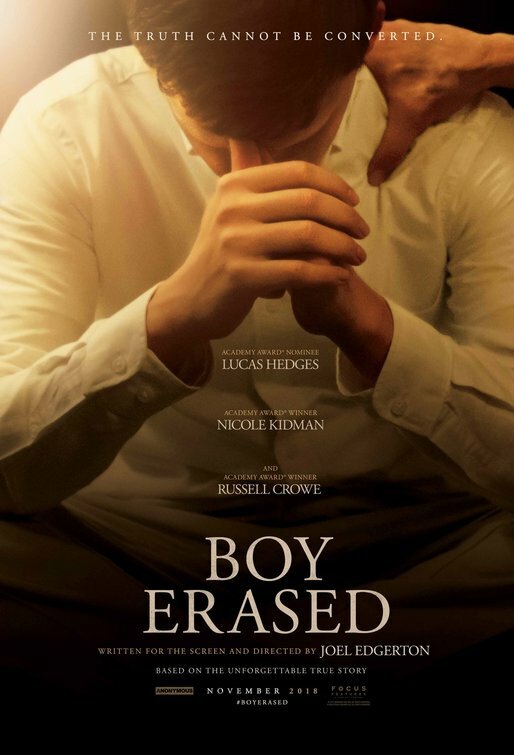 His film The Gift was a fantastic story and now he has added to it with the powerful film Boy Erased. Based on a true story and the book by Garrard Conley about his own experiences. Jared Eamons (Lucas Hedges) was a teen, confused by his sexual orientation and, after some events happened to him at college, he approached his conservative, religious parent with the fear that he has “thoughts” about men. Jared’s father, Marshal Eamons (Russell Crowe), a Baptist preacher, found a conversion therapy program, run by a man named Victor Sykes (Joel Edgerton), that said that they could “cure” Jared of his homosexual tendencies. Once there, Jared slowly begins to realize his mistake and looked for help from his mother Nancy (Nicole Kidmon). The acting in this film, across the board, is phenomenal. All of your main stars give stand out performances in Boy Erased, anchored by another strong, and surprisingly subtle, performance from Lucas Hedges. Hedges has truly cemented himself as one of our finest young actors working today. Joel Edgerton continues to thrive in everything he does. The character of Victor Sykes is one of the most complex and layered characters in this movie, his internal struggle playing off everything that he is trying to do. Russell Crowe is amazing as the Baptist preacher whose faith is challenged by the lifestyle of his son and his love for his son fighting against his personal beliefs. Crowe is shown as a good man who just can not get out of his own way. Nicole Kidmon delivered a fantastic performance as Jared’s mother, who is able to show both her conflicted faith and her fierce protective nature for her son. Just the fact that places like this conversion center ever existed is a stain on our life and culture, but what is worse is that these places continue to exist. The info at the end of the film indicated that 36 states still allow these places to be legal. In the world of 2018, that ignorance is simply unacceptable and backwater. We need to move past this kind of bigotry and start dealing with people as people. Boy Erased does just that in some very powerful moments. Admittedly, the film starts a little slow, but the performances certainly outweigh any negatives. This is a potent film that has a message that we all need to hear.